The number of trains carrying oil along the Columbia River between Oregon and Washington could dramatically increase. There’s a plan to ship more oil from the Bakken region of North Dakota to a proposed oil terminal in southwest Washington state. An oil train derailment earlier this year has shown the potential danger faced by the region. 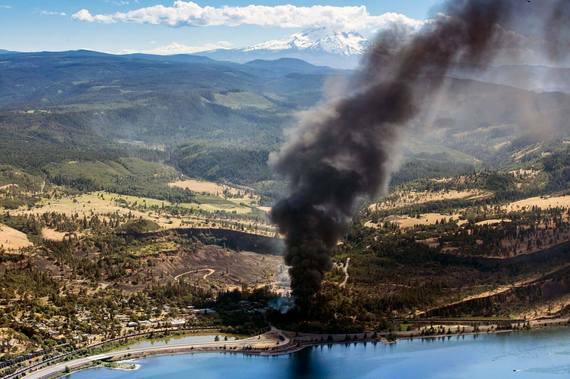 In the Northwest, the number of trains carrying oil along the Columbia River could dramatically increase, and that’s sharpened a debate over oil train safety in Washington state and Oregon. There’s a plan to ship more oil from the Bakken region to a proposed oil terminal in Washington. As Conrad Wilson of Oregon Public Broadcasting reports, a recent derailment has shown the potential danger the area faces. CONRAD WILSON, BYLINE: On a Friday in early June, more than 40,000 gallons of Bakken crude spilled in a fiery oil train derailment that burned for 14 hours. EMILY REED: It is an incredibly scary thing to have something like this happen so – and within our city limits, so close to our school. WILSON: Emily Reed is the city council president in Mosier, Ore., the town where the derailment took place. About 500 people live in Mosier, and 100 of them were forced to evacuate when the oil train derailed. Reed points out the town’s deep in the Columbia River Gorge, a canyon with steep cliffs, where winds can reach 40 miles per hour during the summer. REED: If the wind had been as it is today or more, we would have had a fire going up more than four of those cars, all the way through town and wiping out our town. WILSON: Union Pacific was to blame for the derailment that caused the oil spill, according to a preliminary report by the Federal Railroad Administration. It says Union Pacific didn’t maintain its tracks properly. However, an inspector certified by that same federal agency checked the tracks and gave them the OK a little more than a month before the derailment. JERRY OLIVER: It was unfortunate for the community. WILSON: Jerry Oliver is a port commissioner in Vancouver, Wash., and a vocal supporter of what would be the largest oil-by-rail terminal in the country, known as the Vancouver Energy Project. OLIVER: It’s also unfortunate because it gives a tremendous black eye to anything related to fossil fuels. WILSON: If built, the terminal would more than double the number of mile-long oil trains traveling along the Columbia River, to about 46 trains per week. Serena Larkin is with the Sightline Institute, a Seattle-based think tank that opposes the oil terminal. She says until Mosier, oil train derailments were the kind of thing that happened somewhere else. SERENA LARKIN: Mosier proved that we’re not any different. We are just as vulnerable. We are facing the exact same risks from oil trains that everyone else in North America is facing right now. WILSON: Despite low oil prices, proponents of the project say the terminal is needed to reduce foreign imports and move domestic oil. For now, it’s relying on oil trains because there aren’t enough pipelines to move oil from North Dakota to the West Coast. Larkin says Mosier’s a turning point in the debate surrounding the Vancouver oil terminal and one that will weigh heavily on whether the project gets permitted. LARKIN: It showed what the Vancouver oil terminal is really asking Northwest communities to shoulder in risk. DAN RILEY: I strongly believe that all accidents are preventable. WILSON: Dan Riley is vice president of government affairs for Tesoro, an oil company behind the project. Since the derailment in Mosier, he says there has been more scrutiny. RILEY: I think that the criticism is not of the project, but of the rail system. WILSON: Reilly says Tesoro has also pledged to only allow tank cars with thicker shells and other safety features designed to withstand a derailment into the Vancouver facility. But that’s done little to ease the safety concerns of firefighters and environmental groups. Ultimately, Washington Gov. Jay Inslee has the final say on whether the project gets approved. That decision could come later this year. Inslee’s acknowledged the risk oil trains pose. He says the Mosier derailment is among the things he’ll consider when determining whether or not he’ll permit the oil terminal. For NPR News, I’m Conrad Wilson in Vancouver, Wash.
Just a little over two months ago, a disastrous oil train derailment occurred in Mosier, Oregon, spilling 47,000 gallons of Bakken crude oil from North Dakota. The fallout from that accident has seen the entire region debating whether transporting this hazardous crude oil by rail through local communities and along our nation’s rivers is worth the risk. It’s time for the debate to close, and for all sides to realize the hard truth: oil trains like the one that derailed in Mosier pose an immediate threat to communities around the country, and it is time we demand immediate action. Waterkeeper Alliance’s report, Deadly Crossing: Neglected Bridges & Exploding Oil Trains, written in partnership with STAND and Hudson Riverkeeper, showed that many of the bridges these oil trains pass over show signs of neglect and disrepair. The report also highlighted that the public cannot access any meaningful information regarding the safety of rail bridges in their community. In response to these concerns, the Federal Railroad Administration (FRA) now has a way for local officials to request public bridge inspections. This is a small victory, but the threat of these oil trains still lingers in communities across the country, and the only true solution is to ban these trains altogether. No community wants a potentially lethal oil train speeding past their schools, behind their homes, or near their precious water sources. We need to stand together to demand a complete ban on oil trains. Please join this petition to call on the Department of Transportation to recognize that oil trains are inherently unsafe for our communities and waterways, and to use all available authority to stop oil train traffic throughout the country.